The Bottom Line: Five stars for the writing. Zero stars for the marketing. Kyle Mills does his best Vince Flynn impersonation, and once again, comes up golden (see where this book ranks in our list of all-time best Vince Flynn books). Vince Flynn, Tom Clancy and Robert Ludlum have more than a genre in common; the books that roll off the production line bearing their names are no longer written by them, as these great authors are all, sadly, long dead. It’s easy to see why publishing houses continue to market these books as such: greed. But given how well stand-ins like Kyle Mills do writing the Mitch Rapp books, the whole exercise seems silly. Isn’t it time to start putting his name in the marquee spot? 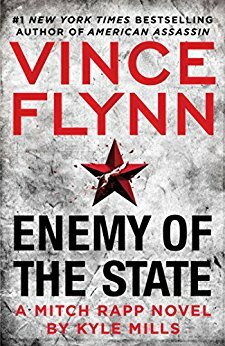 Or better yet, the name of Flynn’s longtime hero, Mitch Rapp? The way things stand now, it’s starting to feel like the Facebook page of a long-dead friend whose family continues to publish new material in their name. A little creepy. You already know the answer to that question. Still, the journey is well worth taking. Read it.